SEOUL, Jan. 16 (Aju News) -- Researchers at a prominent South Korean science school have developed a 3D-printed thermoelectric generator which can be used to turn the residual in heating pipes and car exhaust pipes into electricity. The Ulsan National Institute of Science and Technology's Department of Materials Science and Engineering said Tuesday that its research team led by professor Son Jae-sung has created a 3D-printed thermoelectric generator made with inorganic thermoelectric 3D printer ink. Son said the new generator is the first of its kind and will be applied to many industries. 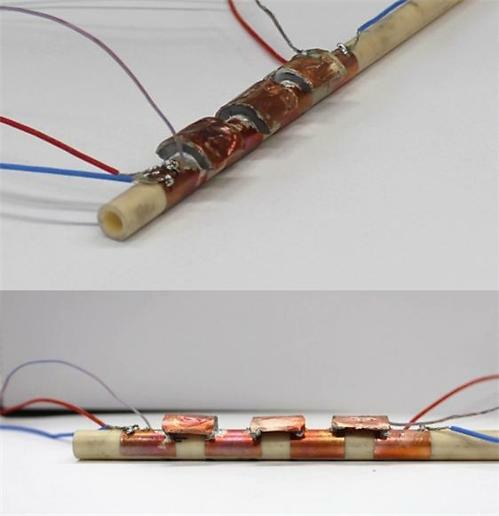 "This technology has overcome the limits of previous thermoelectric materials," he said. Thermoelectric generation turns heat into electricity and is considered a vital element in clean energy because it can collect residual heat energy. Because generators are in direct contact with heat sources such as pipes or flat surfaces, conventional ones were not very thermally effective. Their rectangular shape makes it impossible to completely cover the heat source. Son's team said that 3D-printed generators are about 60 percent more effective than conventional ones.